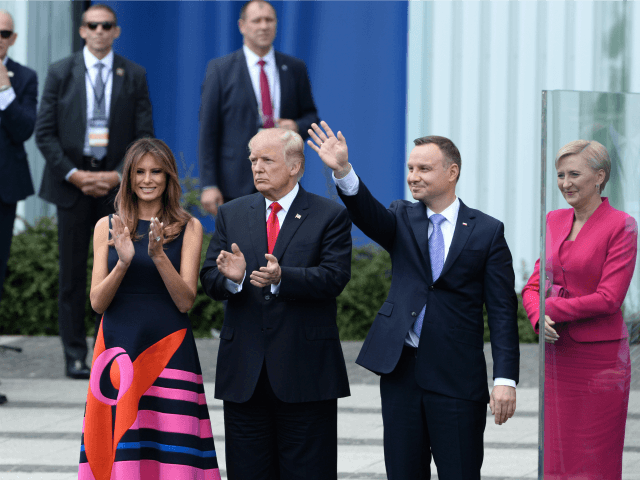 Dr. Sebastian Gorka, Deputy Assistant to the President and former National Security editor for Breitbart News, talked about President Trump’s trip to Poland and the G20 summit on Friday’s Breitbart News Daily. Gorka told SiriusXM host Alex Marlow it was “stunning” to watch the president of Poland step in to defuse a Fake News story about his wife supposedly snubbing President Trump on stage. “We’ve had the Russia hoax – and it is a hoax – for now more than five months. That’s failed utterly and completely, but they can’t move on. It’s that codependency of the unhealthy relationship, where the mainstream media is not prepared to understand the reality, and they will continue to peddle their fake news,” he said. “It doesn’t matter to us, or to the people that elected Donald J. Trump president,” Gorka declared. He said Trump’s widely praised (and, in certain quarters of the left, bitterly denounced) speech in Warsaw was the work of both the president himself and “supreme wordsmiths” working for the White House. “We are in a country in Poland that stood up to, maintained the values of family, of God, not only under Nazi dictatorship but also under Communism. The church in Poland – remember it wasn’t just about Solidarnosc, it wasn’t just about Solidarity, it was also about the Church. They never bowed to Communist dictatorship,” he recalled. “We joined shoulder to shoulder with our Polish comrades and we said, ‘We will triumph. Western civilization will triumph, will prevail. We have a new dictatorial, a new totalitarian threat today, and that comes from radical Islamic terrorism. We’re going to be clear about the threat and clear about who we are, and we’re going to stand shoulder-to-shoulder with great nations like Poland,” said Gorka. Marlow observed that Trump went from a warm reception in Poland to chilling “Welcome to Hell” fascist and anarchist riots in Germany at the G20 summit. “Even for Germany, which has consistently been on the wrong side of history, this is an incredible contrast versus Poland,” he said. “Whether it’s the ‘watermelon’ of the environmental movement that is green on the outside and deep, deep red on the inside, or whether it’s these really fascist anti-globalists, or what they call anti-globalist movements, it demonstrates one thing, Alex: President Reagan was right. The loss of liberty is always but one generation away. Those who lived it, myself included, we may believe we had won in 1989 when the Wall fell, but sooner or later these ideologies – like the zombies of The Walking Dead – come back, and they undermine our prosperity and our freedom,” he warned.